Developed by remake master Sokurah, Binary Land is a new take on the classic NES game published in 1985 by Hudson Soft. The player has to unite two passionate penguins but so many dangers and horrible monsters remain between them. 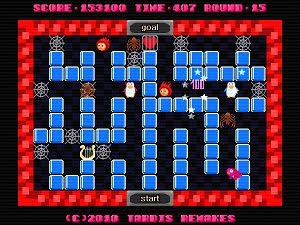 This freeware PC puzzle game has a very original and intricate gameplay mechanic – you only control directly one of the penguins horizontally, while the other one reacts in the opposite direction. The player can still destroy the enemies but this gameplay twist is sure to leave anyone scratching their heads. The game runs on a 640x480 video resolution and the graphics are cute and perfectly functional.